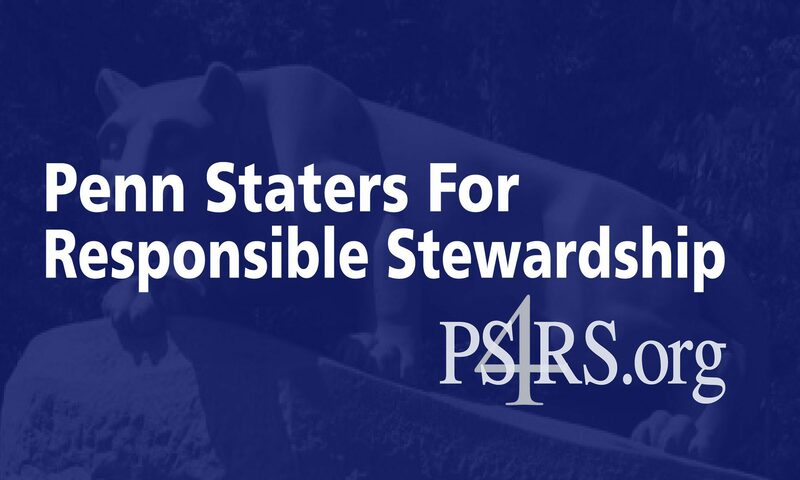 April 4, 2013 —- The recent doubletalk from Penn State leadership surrounding the school’s role in potentially authoring its own NCAA punishment is not only disconcerting, but downright negligent and contradictory to the University’s pledge of transparency, according to members of the grassroots watchdog group Penn Staters for Responsible Stewardship. Since July 2012, Penn State President Rodney Erickson has repeatedly stated that the University was threatened with the “death penalty” by the NCAA as a result of the conclusions set forth in the report authored by the law firm of Freeh, Sporkin & Sullivan. Released just eleven days before the NCAA formally announced its sanctions, the Freeh Report has since been criticized as inherently flawed and incomplete by PS4RS, former United States Attorney General Richard Thornburgh, and current Pennsylvania Governor Tom Corbett, among others. Members of the 18,000 alumni watchdog group are today demanding answers from Penn State’s Board of Trustees. In this regard, PS4RS is demanding that the following be disclosed immediately by the University: (1) all correspondence, documents, and communications of any nature related to the NCAA sanctions and consent decree from November 2011 to the present; (2) all correspondence, documents, and communications of any nature between the University, or anyone acting on behalf of the University, including but not limited to anyone affiliated with the law firms of Freeh,Sporkin & Sullivan, Pepper Hamilton, Reed Smith, or Lightfoot, Franklin& White, LLP, and the NCAA, or anyone acting on behalf of the NCAA, from November 2011 to the present, related in any way to the University, the NCAA sanctions, or the consent decree; (3) any and all University phone records detailing communications between the University and the NCAA from November 2011 to the present; and (4) a written list, including dates, times, names of participants, and subject matter, of all verbal communications between the University, or anyone acting on behalf of the University, and the NCAA, or anyone acting on behalf of the NCAA, from November 2011 to the present. “Should we ultimately find that Penn State was complicit in the imposition of the sanctions, or that President Erickson misrepresented the events that led to the execution of the consent decree, then it is reasonable to conclude that theBoard of Trustees and administration have been dishonest with the Penn State community and have failed wholly and completely in their fiduciary responsibility to the University,” said Schmidt. Erickson and the BOT = lies and the lying liars. If only this would result in a court case and Erickson had to tell his “tale” under oath while Ray and Najjar contradicted him.